Amnesia: The Dark Descent was one of the big indie game successes of 2010. I’m sure most young folks who’re into PC gaming have heard about it: it’s a horror game which focuses on ambiance and survival rather than action. Like Eternal Darkness: Sanity’s Requiem and Call Of Cthulhu: Dark Corner’s Of The Earth, it not only has a sub-title but also a sanity system: looking at enemies, encountering odd phenomena or staying in the darkness too long will lead to your sanity dropping. This seems to mainly result in blurred vision and wobbly controls, as well as a sound which I believe is supposed to be the grinding of teeth. So nothing quite as interesting as the insanity effects of Eternal Darkness, which included rooms suddenly being upside down and the game telling you all save game data has been deleted. The narration could’ve been better. That was my main problem with the game. The story is told through generally tedious diary entries, some of which are read aloud to you and some which aren’t, and through “non-visual cutscenes” – i.e. your vision will get all blurry and you’ll hear some past event. With fewer, shorter, and better written diary entries it could’ve been better, and maybe with some actual visual cutscenes to spice things up. The game was definitely scary, and towards the end it started getting slightly disturbing too (like when you heard how the different people had been tortured). Is it the scariest game ever made, as I’ve seen some young folks out there claim? Personally, I’d say no; to me that might be the PC game Condemned. But then again I didn’t try playing it with headphones, as the developer recommended, and as I’ve done with a couple of other horror games. I also went into it half-expecting it to be the scariest game ever, which may have made me set the bar too high, or made me want to prove that I’m some sort of tough guy for not finding it as scary as everyone else. And I’m not sure if it enchanced or hampered my gaming experience that I watched a few narrated Let’s Play videos on YouTube of the game while I was playing, whenever I got a bit stuck. It might’ve made the experience less scary and immersive, but on the plus side it made it feel like I had company when playing and like I was sharing the experience with someone. And fun hearing how scared those playing often were. Overall the game was pretty good, and a fresh breath of air from the higher-budget horror titles the larger publishers have been pumping out, which have almost been reduced to pure action games. But it wasn’t great. (And it lost a few points for having a protagonist with amnesia, the oldest trick in the storyteller’s cheat guide.) If you like Lovecraftian horror games which focus more on atmosphere than narration, probably worth looking into. 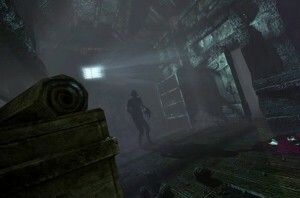 This entry was posted in games and tagged amnesia, condemned, horror, review. Bookmark the permalink.